MakerBot Filament is manufactured to produce the highest quality 3D prints and is trusted by leading companies and institutions all over the world thanks to state-of-the-art filament manufacturing & quality control standards. MakerBot Filament is extensively tested and designed to be the best and most consistent printing material for MakerBot 3D Printers. With a dependable diameter, MakerBot Filament utilizes tight tolerances to maintain a steady flow through the extruder. With a wide range of options, choose the material and colour that suits your design needs. A corn-based bioplastic. The most consistent filament for MakerBot 3D Printers. Safe for the classroom, office, or home. PLA Filament is non-toxic and easy-to-print with minimal warping or curling. Details such as sharp corners and edges print well and will generally display a glossier look and feel. Choose between small and large spools to produce the higher quality prints, reduce filament problems and minimize downtime. MakerBot Tough PLA Filament is as tough as ABS, as reliable as PLA and is made to create durable, high-impact strength prototypes & fixtures. Tough PLA is engineered and tested for consistent results featuring tensile, impact and flexural strength that’s similar to ABS. Print jigs and fixtures with threaded and snap fits that can withstand repeated use. MakerBot ABS Filament is the best, most consistent, and most tested ABS Filament for your MakerBot 3D Printer. More flexible than PLA, Makerbot ABS is great for mechanical designs or ones that have interlocking or pin-connected pieces. ABS has a longer lifespan, more impact resistant and displays a matte look & finish compared to PLA. With a high melting point, MakerBot ABS is also suitable for machines or car parts. Open up a world of creative and exciting possiblities with flexible, durable parts. 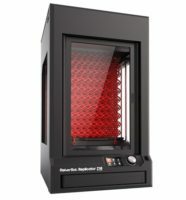 MakerBot Flexible Filament is polyester-based with a low melting point making it easier to extrude. Create new opportunities to stretch the limits of 3D printing as you create objects such as functional hinges, joints and things shaped to fit the human body.